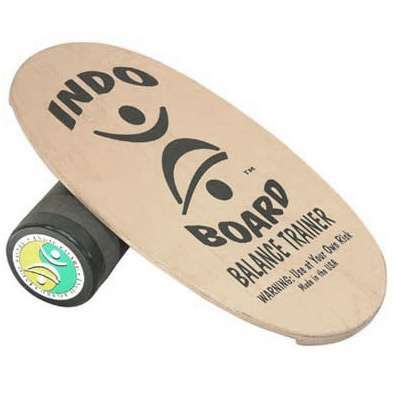 The Indo Board is one of the most popular balance trainers. It consists of 30" long wooden board which stands on a large cylindrical roller. This offers a great deal of instability which is great for improving your balance and coordination, strengthening muscles and effective training for many sports (for example surfing, skating, skiing, snowboarding and others). Good news is that Indo Boards can be used by both beginners and advanced users – starting with basic exercising and continue to more difficult tricks and even jumps. The board not attached to the roller so it offers even more flexibility. The Original Indo Board is the easiest and most popular of all their models – perfect to start with. If you are a beginner, consider getting it together with the Balance Cushion – it`s great for practicing before stepping onto the roller (see the comparison of cushion and roller on the pictures above). There is also an upgraded (and more expensive) version called the PRO – the board is longer so it simulates the surf or snowboard much better. 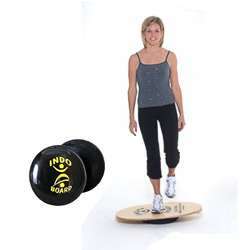 It offers a more intensive workout, mainly increasing leg strength – ideal for all surfers and snowboarders. In this package you the pro board, roller, FLO cushion and a training DVD – learn more or buy it here.